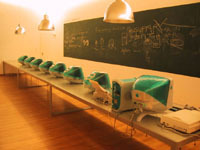 Within the Museum of Applied Arts Frankfurt, digitalcraft coordinates two perfectly equipped computer laboratories. With the support of our partners the AndersenLab and the "digitalcraft space" were set up in the public exhibition area. 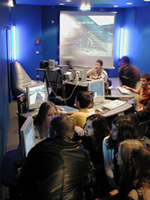 Our course offers in the two laboratories are adapted to the needs of different user groups and are accompanied by course tutors experienced in media pedagogy. Webdesign: in project groups we plan and create websites together. Golden.surf.club: here we want to give an introduction to the computer and the internet to youthful adults. Pixel.land for our youngest visitors and bild.experimente, where the possibilities of digital picture arrangement are explained for everyone interested. In the PC-based digitalcraft space, where also exhibitions take place, our offer is mainly adapted to young people’s interests. In test.drive the motto is gaming for everybody. Every Friday recent and older games are played on consoles and in the PC network. In our remix-workshop everybody can become a music producer. With keyboard, multi-track system, microphone and the newest software you enter the world of pop music playfully.